A concept diagram is a sketch to see what will fit into a given space. Additionally, I can use the profile capabilities in XTrkCAD to estimate track length and grades. When available, I add additional details. The first concept is a single deck version that provides for a continuous run. It includes my key locations of Farmington (all three yards well represented), Strong, Kingfield (extremely compressed), Bigelow, and Phillips. A backdrop would separate the F&M at between Carrabassett and Bigelow would be separated from the P&R at Madrid. The P&R like would be too short to represent the whole of the P&R. So it seem like a better choice would be to model the Madrid branch and have a Rangeley staging yard under Carrabassett. The Madrid branch would provide an option to model several logging and pulpwood loading spurs. There isn’t an option for the P&R to have a reversing loop, as the radius would be too tight under at the end of the peninsula. The prototype Kingfield was located on a stub. There is insufficient room at Kingfield for a faithful representation. As a whole, the concept is “tight”. It fully fills the space leaving little social space. Farmington would stop 3-4 feet short of Starbirds, so that operators on the F&M could watch their trains come down from Kingfield to Strong, and back to the strong station. A backdrop would separate Farmington from Kingfield, and I see the backdrop wrapping around the south end of Strong, so that operators at Farmington would not easily see what is going on in Strong. It might be possible to enable operators to duck under from Starbirds to Strong. 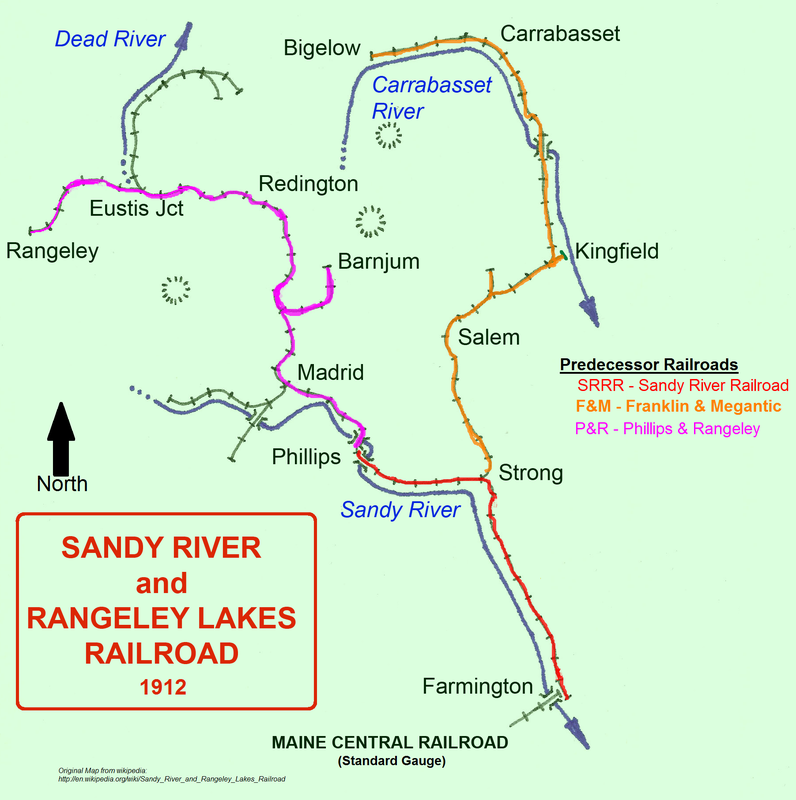 I see 3 operators running trains between Farmington and Phillips and on to Rangeley staging. I think 2 operators could run the F&M between Strong and Kingfield. The layout could run in TT&TO if desired. The sawmills at Bigelow and Madrid would receive log trains. The layout would do a good job of simulating the meeting of trains at Strong.